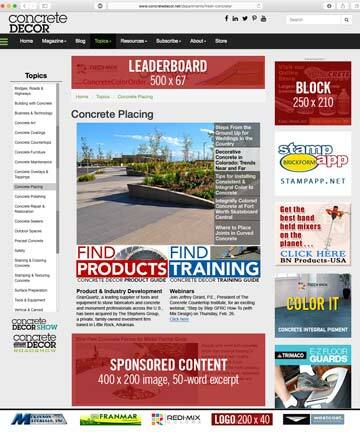 Banner ads on www.concretedecor.net generate up to 1.3M impressions each month and average from 200 to 700 clicks. That’s the power of Concrete Decor and its industry-rich online content. Reach targeted prospects who make purchasing decisions. Online solutions start with www.concretedecor.net. This is where nearly 100,000 industry professionals turn to do the research for purchasing decisions. Choose from our robust portfolio of interactive products (shown below) that allow you to deliver your message to audiences of your choice. On average 70 percent of website traffic to www.ConcreteDecor.net originates with desktop and laptop computers. Another 30 percent comes from mobile devices. Make sure your company is always a click away on the ultimate on-demand reference for decorative concrete professionals. (Amazon Alexa Traffic Ranking: Bounce rate 45%, Average Page Views: 13 pages, Time on site: 18 minutes). Ad Submission Deadline: 5 business days prior to start of each month of which ad is scheduled to appear. Target key industry audiences with banner advertising placed with current or archived article content on www.concretedecor.net. Optimized for search engines, ads placed with your sponsored content — in addition to our rich archive relevant website content — is a great value to viewers. Choose up to three articles for a full year. Crank it up with scheduled social media call-out by Concrete Decor. 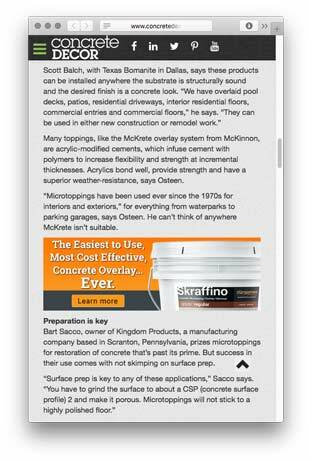 Reach even further with an advertorial banner and article link in one or more of Concrete Decor magazine’s bi-weekly e-newsletters. Sponsored Content is SEO-optimized and keyword tagged, shared via social networks (Twitter & Facebook) and searchable on Google, Bing and other search engines. Sponsored Content is published on www.concretedecor.net listed under Special Feature. Over time, Sponsored Content builds deep referring links back to your website, one of the key metrics used by Google, Bing and others in ranking your site in search results. Call for price quote. 2. 400x200px responsive image and 50-word excerpt of the article for www.concretedecor.net homepage. 3. Full article with text of any length, multiple images and links, and optional video for website. 6. Author bio, headshot and email link can also be included.